I noticed on the official PCUSA website that amendment A has passed. This was the 'shut your eyes, cover your ears, and scream the creed at the top of your lungs in front of an entire group of people to show your love for Jesus' amendment. I was the only blogger I know of beating the drum against it. I suppose most people thought I was overreacting. Maybe so. I hope no mischief will come of this amendment. It was designed for mischief, make no mistake about that. I felt it was a slap in the face of one of the few truly progressive congregations in our denomination. This amendment arose from the presbytery in which one of its congregations was taken to church court for admitting into membership a person who embraced reason. Gasp. 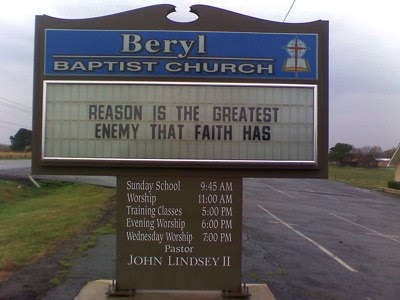 Yes this is an actual church signboard, not a fake one, from a church in Arkansas. Thanks to Monkerstein for posting it. It was first posted here. Truer words were never more ironically spoken. Meanwhile, the Episcopalians sack a priest because they reason that it is illogical to believe in two mythological deities at the same time. So I continue to bang my head against Peter's rock. The rock solid superstition of institutional religion that regards peddling theological antiquities, the forced regurgitation of slogans, and ecclesiastical rule-making as its greatest triumphs. Because I think it is supposed to be about the endless quest for truth and goodness. And I enjoy the covered dish suppers. This makes me very sad. I shared your concern about the amendment. Obviously it will not be enforced against each of us who is in some may not "orthodox", but it will make witch hunts much easier. It seems to say, "If you don't always unquestioningly believe exactly what we tell you to believe, you better sit down and be quiet because if you cause any trouble we now have the power to come after you." What happened to the priesthood of all believers? What happened to "God alone is lord of the conscience"? Who are they to judge, when we all fall short in the sight of God? The issue for me is that we already have in our BOO the requirements for membership including affirming Christ as Lord and Savior. It is the pushy, controlling, punitive aspect of how this all developed that annoys me. It passed so it is a moot point. I didn't want it to go by without raising my objection, which I did.